It was a venti day on the Lynnway. 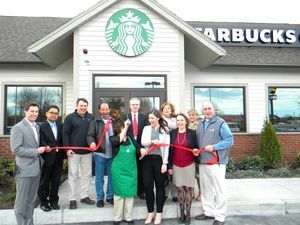 The city celebrated the official opening of Starbucks on Thursday with a ribbon cutting and complimentary coffee for all. The café, located at 821 Lynnway, features an extensive menu, indoor and outdoor seating and drive-through service. “It’s going to be fantastically successful,” said Swampscott resident Andrew Rose, who owns the franchise along with Mark Klaman and Rich Newburg, all of Centercorp Retail Properties. They also own Starbucks franchises in Marblehead and Connecticut. Their expanded tenant roster includes retailers such as Whole Foods, CVS and Stop & Shop. Store Manager Sandra Clavero, a Harvard graduate and native of Argentina, has worked for Starbucks for the past 10 years and is excited about the opening. Patrons can visit the new location 4:30 a.m. to 9 p.m. Monday through Friday and 5 a.m. to 9 p.m. on weekends.